Of Horses and Men: Yea for slow appy's! The pic above is from last week riding outside. It was very windy and the campra caught us in an awkward position, but I guess any picture is better than none. Just as the title implies, my little jumping speed demon is really starting to slooooooow down and look more like a hunter than a jumper. 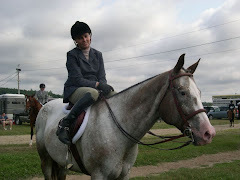 We have had a couple of very good rides in the outdoor arena which totally makes me happy. Our outdoor is not completely flat, it has a a noticeable downhill grade from top to bottom. 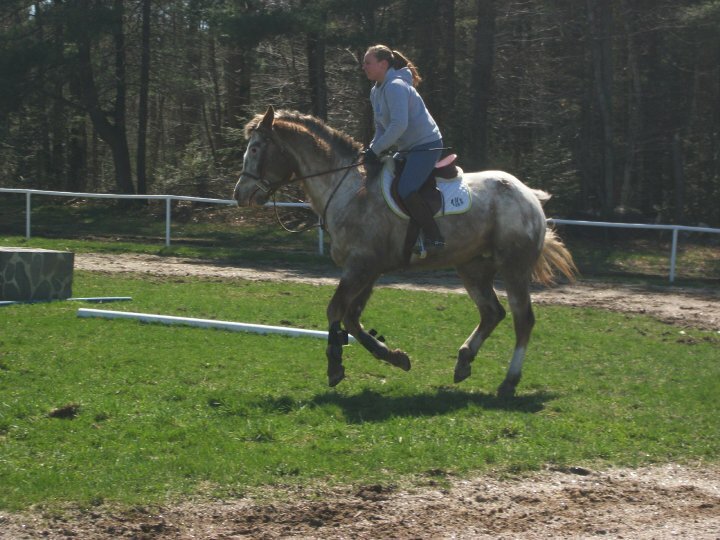 My horse is also built downhill, so down-hill plus down-hill equals running around on the forehand. Well he has been staying more collected and listening to my aids and in the lines he is listening to my half halts and really sitting back on those high haunches of his to maintain a consistent and rhythmical pace. He has been so good that our schooling rides have become much shorter, around 40 minutes or so. When he gets something right consistently, I move on and don't dwell on it so that he knows that he did a good job. He has also been rally listening to me in terms of changes of direction. Possum is notorious for charging down lines and not being prepared for tight rollbacks or broken lines. Well that has also changed. I was really challenging him and myself the other day with doind some seemingly impossible tight turns and broken lines. He was soft and responsive and did not buldge and run through his shoulder, and was even turning almost in mid air to prepare for the turn that I was looking towards. I was pleasantly suprised and was praying that this was not just some fluke, but it seems to be consistent as of lately. One of the things that I have changed about myself is to relax more. I try not to be so tense or workman like, because that gets him keyed up and ready for anything. There is a fine balance in jumping of being too tight or too loosey goosey. Legs are always tight, calf and thigh, back is always straight with head up, so finding a relaxation zone in all of that can be hard. But I think I'm mastering it and it's filtering through to my horse. 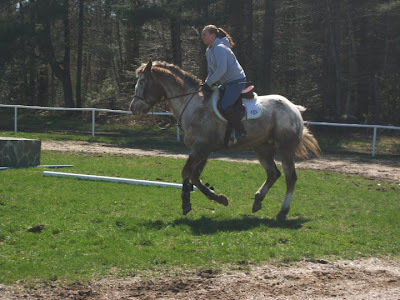 I have also had so much confidence in my horse lately that I have switched him out of the rubber mouth pelham and put him back in the D-ring which in the past he has just blown through. He is going comfortable and respecting this bit so I will keep it until things change down the line. Plus I really likes the D-ring and it is the "in" bit in the hunter ring, sad I know. So with all that being said I'm really just enjoying my horse lately. 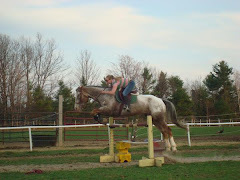 Our jumping sessions are relaxed and fun and easy. Three words I didn't think I would ever say in conjunction with Possum jumping. I'm anxious to show off all the work we have done throughout the winter in some summer shows. Unfortunately with my financial situation it will only be a couple, but still it will be nice to go out there and show with the big dogs. I have also been hanging out with a new boy. Not going to jinx it or anything because it is still very very new, but he is a county comissioner and also the director of a non profit organization that manages one of the largest rivers in Maine and the surrounding watersheds. he is 29, no kids, never been married and he's kinda cute. He is however, very busy and may be kind of a player, still trying to establish that. But we get along well and have a good time together, so who knows what this will bring, but not holding my breath. At the very least I made a new good friend. Well, since you can only afford a couple shows, choose wisely, grasshopper. I'll be anxious to see how you guys do. It's still just too weird to see Possum all shaggy and dark! HEY -- where are you?? I had dial up all summer, and now that I'm back to hispeed, I popped on your blog to see what you and Possum have been up to. No new posts?? Are you okay?? Hope you're just busy!?! I am also lover of horses. I love their activities. Thanks for the posting. Molly, where are you?? Are you okay? Sounds like things are really coming together for you and Possum. I don't know how much I'll be showing this year either due to finances but you're right about it beging good to get out there even if it's just a couple of times. My name is Susan and I have recently relocated from Egypt! During my time in the country I was very actively engaged in equine rescue, and actually helped to launch an equine rescue in the Red Sea area. My experiences opened my eyes to the great hardships endured by the working equines int he country, and in an attempt to raise awareness about the conditions they suffer through I have written a book entitled, "Born of the Pyramids, Rocky's Story." It is actually based around the true story of a horse that I knew who greatly touched not only my heart but the hearts of many that knew him. He displayed great strength and courage, and it is in his honour that I am dedicating this book. Accordingly, proceeds from each copy sold will be donated to equine charities around the world as it only seems right that the book itself is put to a greater good. I have been contacting blogs online and offering free copies of my book (PDF version) in exchange for a review on their site, as ideally the more people that know the better! I am hoping that this is perhaps something that you may be interested in for your blog. Thanks so much for taking the time to read this. I hope to hear from you soon. Hello all, I am back! I needed to take some time from blogging and focus on life a bit and then somehow this blog got pushed to the wayside. I am fine, there was no brain injury as someone eluded to, actually no injury at all so don't know where that came from. Things are plugging along and I will blog for a bit to catch everyone up to speed on what has been going on the past 4 years. Enjoy!